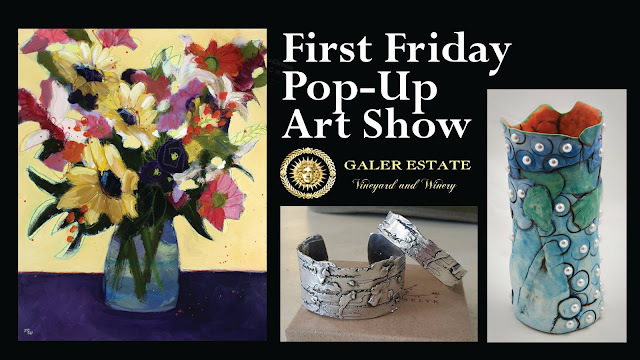 You are invited to enjoy art, music and wine during Galer Winery's FIRST FRIDAY POP-UP ART SHOW! Come on out to Galer Estate Vineyard and Winery in Kennett Square (near Longwood Gardens) for our First Friday Pop-Up Art Show on June 1, 2018 from 4 pm to 8 pm. I will be there showing new work, along with talented artist friends, painters, Maryanne Buschini and Sue Biebuyck plus ceramicist Judy DiSimone and jeweler Hattie Weselyk. Our art show wine special will be $5 glasses of Grüner Veltliner. Acoustic guitar player, Gary Moore, will be performing from 5 pm to 7 pm.